Regular roof maintenance is vital for keeping your roof watertight and preventing expensive future problems. One of the most important things on your roof maintenance checklist should be your pipe and equipment supports. Identifying and troubleshooting problems early will help ensure a long-lasting roof system. To lengthen the lifespan of your roofing system, regularly check your rooftop for the following signs of failure. Flexing or sagging pipes or ducts are a good indication that your rooftop supports are too far apart to bear the weight of the pipe and its contents. The proper spacing of supports depends on the weight of the pipe or duct. You may need to install additional supports or change the fittings to prevent your pipes and ducts from flexing or sagging. If the weight of the pipe or duct and its valves, fittings and pipe contents exceeds the support's maximum weight specifications, you are probably overloading the supports. If you notice cracks in the base of your supports, they are likely not strong enough to support the weight of the pipe and its contents. You may notice the supports digging into the roof membrane, a deflection of the cross bars, or your roof structure itself beginning to deflect. These are all good indications that your have overloaded your supports. 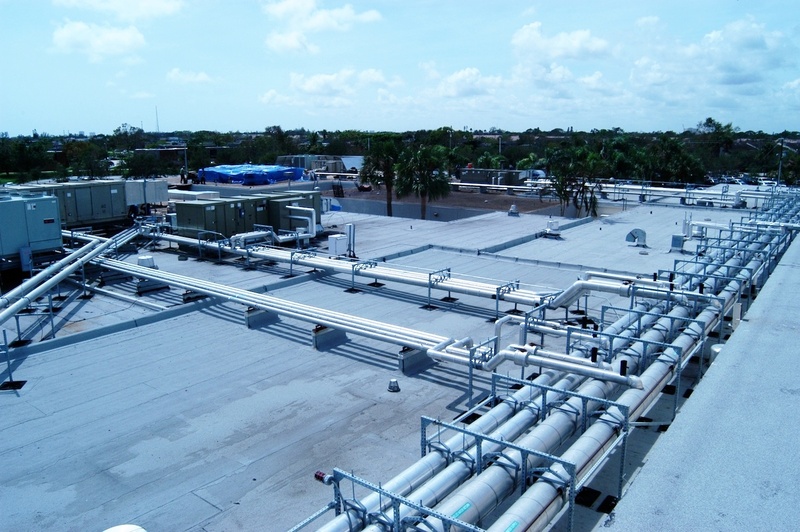 Over time, thermal changes will cause roof piping and ductwork to expand and contract. These dimensional changes will cause stress to pipe joints and other areas within the system. If you observe pipes and ducts lying flush in their hangers, it is a good indication that the system has been stressed and could fracture. When repairing your roof support system, make sure to take pipe expansion into account. As you are maintaining your roof, make sure to thoroughly clear debris and gravel from around and under each pipe support. Debris build-up in the ribs of the supports can stress the pipe joints, compromise the roof membrane or leave the system vulnerable to wind damage. Keeping your roof free of debris can also limit ponding and water build-up that could eventually leak through your roof. If your roof is showing any of these signs of failure, then your pipes and ducts, their supports and even the roof itself may need to be replaced or repaired soon. Any damage that occurs due to overloading will likely not be covered under your roof's warranty. If you can detect these vulnerabilities before major damage occurs, you could save a substantial amount of money in major roof repairs. If you would like a partner that can help you make sure repairs are performed perfectly the first time, contact PHP today!